Panda Masamune here. I don’t know what it is about Orphen that makes it so enjoyable. It might be that it has excellent art. It might be that it is based on a light-novel series (which usually makes for better stories). Or it might just be that I started reading this the same day that I finished the atrocious first four volumes of Rurouni Kenshin. For whatever reason though, I enjoyed this flawed gem maybe a little more than I should have. Number of Volumes: 6. It’s completed, but the planned sequel never came, so the story is incomplete. Availability: It seems like I used to see this title wherever I went, and it is still available in many libraries. However, ADV went out of business a couple of years ago, so I don’t know whether or not this is still available. It looks like Amazon only has 1 or 2 copies of each book, so my assumption is that it is out of print. It is probably still widely available in used book stores in Japan. Production Note: This manga is almost entirely done by Hajime Sawada. Yoshinobu Akita and Yuuya Kusaka were involved in the original light novel series. Here is the confusing part: there are two separate light novel series with the exact same characters and the same story. Apparently, after the original story had been in production for a number of years, the author went back and re-wrote it as a comedy story. This manga is based on the comedy version of the light novels. Orphen (real name: Krylancelo) is a magical mercenary with a carefree attitude and a complicated past. Once one of the top students of a school for sorcerers , he left after learning the reason for his training. Now, he lives day-to-day working odd jobs, including tracking down pet dragons, in order to pay his bills, or rather, his debts. His missions bring him into contact with a colorful cast of characters including Cleao, Majic (his apprentice), and a few comic relief characters. 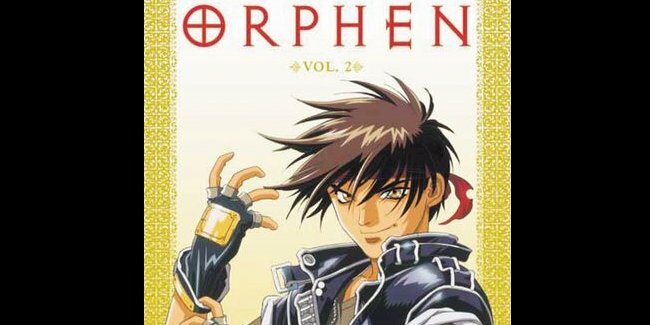 There is a deeper story involving Orphen’s former classmates that probably became the main story of the series. However, the manga ends abruptly at volume 6, even though the story is far from finished. As I said in the intro, I can’t pinpoint why I liked this manga so much. It has its obvious flaws, not the least of which is that it stops at volume 6, whereas its source material obviously keeps going. (Because of this, my advice is to stop after volume 4, which is the end of a story arc.) Also, it is nothing if not a product of the 90’s. Everything from Cleao’s jeans (very high waist) to Orphen’s ripped-off-of-Han-Solo attitude fits that decade perfectly. Still, it is the 90’s done well, and maybe that’s why I like it. But let’s be clear: Orphen is not a masterpiece. It is simply an enjoyable manga. Now, let’s talk about what it does right. First, it establishes its characters quickly and well without making them one-dimensional. Second, it knows just when to be serious and just when to be humorous. The fight against the pet Mist Dragon gave me more than a few chuckles, and yet Orphen’s recollections of watching his best friend turn into a monster after a spell gone wrong still tugged at the heartstrings. Then there is the art. It is gorgeous. I immediately googled Akita trying to find out what else he has done, but unfortunately found nothing. The characters are well-drawn, the framing on the pages is generally above-average, the textures and shading are well-done, and it is always clear what is going on in each frame. Story aside, this is one of the best-looking mangas I have come across and easily holds its own against the competition. But I can’t get over the fact that this story doesn’t end, ultimately making volumes 5&6 a wasted effort that goes nowhere. That knocks this down from a 4/5 to a 3/5 and ultimately makes this manga skip-able. One of the central plot points in this series is the relationship between Orphen and his childhood friend and classmate Azalie. Years ago, they attended a magic school together and were the best of friends. Azalie even admits to having feeings for him. Two things happened to break the two of them apart though. First, Azalie, the top student of the school, did a magical experiment that failed. It ended up morphing her into a monster before Orphen’s eyes, devastating him. Second, Orphen finds out that the only reason he was admitted to the school and trained was to assassinate Azalie, who was growing too powerful. When those two events happened, he left the school and became a mercenary. Years later, he and Azalie re-unite. Their interaction is very true-to-life though. It is not happy. They have both changed and become different people. Even though he left the school because of her, Orphen realizes that he cannot follow Azalie’s lead anymore, as she has made choices that he cannot agree with. Her transformation forced him into making a decision, but he moved beyond that decision and became a different person. I really liked that dynamic in the story, because often, when we fall out of contact with someone, we have a view of them in our minds that becomes trapped in time. Often, when we see them again, we find that we have changed and they have changed, and it’s not as easy to be friends with each other as we once thought. However, when we realize this, we can take steps to bridging that gap.